The black MacBeth Women’s Giuliana Trunk Luggage is a two-piece set that is made up of a 21 inch small cabin bag and a large 28-inch suitcase. 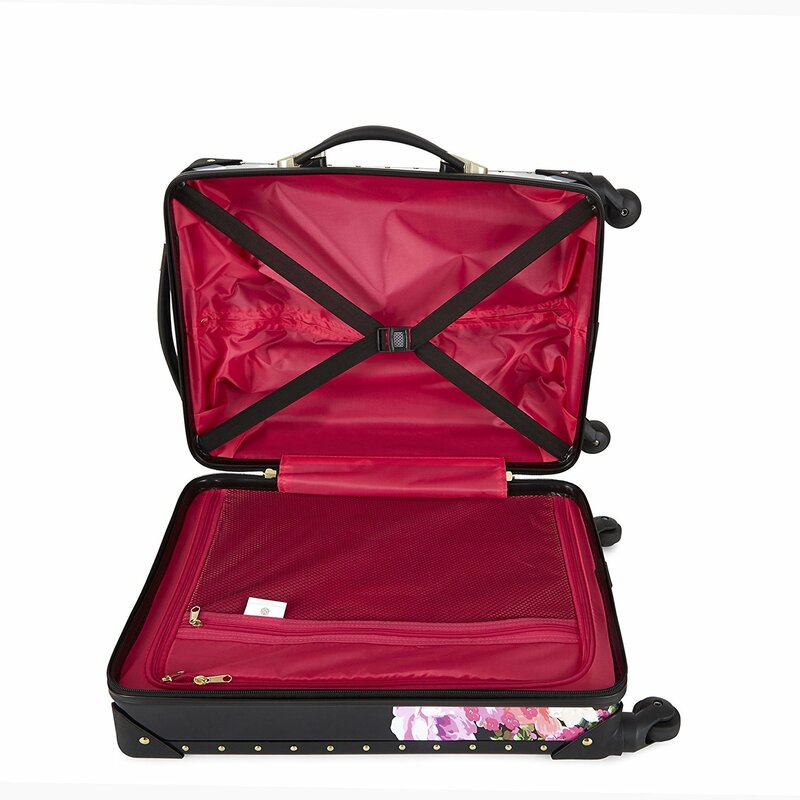 It has a very nice travel trunk style that includes a beautiful flower print on the bottom part. You also have the option to get the 21.5-inch duffel with the same black and floral print. Both the 21 and 28-inch suitcases have the multi directional upright rolling spinner wheels that move 360 degrees easily even in tight spaces, offering great manouverability. And they will move smoothly and effortlessly on the parking and airport terminal grounds. This will be helped greatly by the two-stage aluminum telescoping handle with a nice comfy grip and a gold metallic finish and a modern and luxurious appearance. You also have the comfy to hold side and top panel handles. The small cabin bag weighs 6.85 pounds and measures 8 x 14.5 x 21.5 inches and you can take it onto the plane as your carry-on bag. The 28-inch suitcase weighs 11.11 pounds measures 11 x 19.5 x 28 inches and needs to be checked in before your flight. The duffel bag measures 11 x 21.8 x 11 inches and weighs 4.75 pounds and would also be suitable for use as a cabin bag. It is all about style and design with MacBeth Collection bags and suitcases by Margaret Josephs and you’ll find a nice combo of monochrome polka dot and a lovely Macbeth type rose colored floral print on ABS plastic. You have the style and pretty appearance and also the sturdy and durable construction. The main compartment is divided into two sections with an interior zipper section and cross clothing compression straps. There is a small piece at the bottom that holds it vertically so that it won’t fall over. Macbeth Collection is known throughout the world especially for their beautiful design that represents the personal touch of the owner Margaret Josephs. She travels a lot and gets inspired from the different destinations she discovers. You’ll find whimsical detailing, attractive colors and different unique prints on their suitcases, bags, ready-to-wear and other travel items. Fun is put into functionality in the Macbeth collection and you’ll enjoy taking them on your different travels. And the Giuliana Trunk suitcase set and the duffel bag offer quite a lot for money.